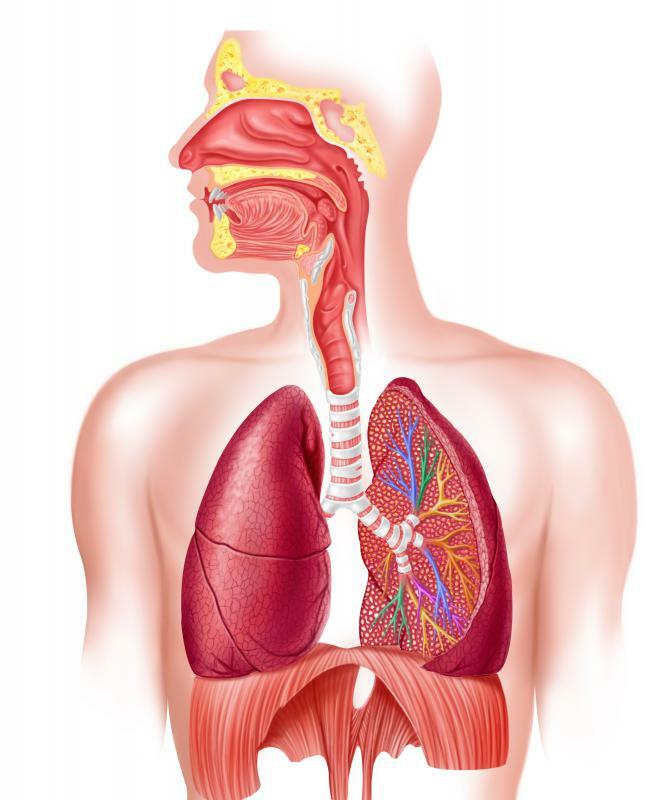 The diaphragm's main function is to control breathing. The diaphragm is a layer of muscle positioned inside the lower portion of the rib cage. 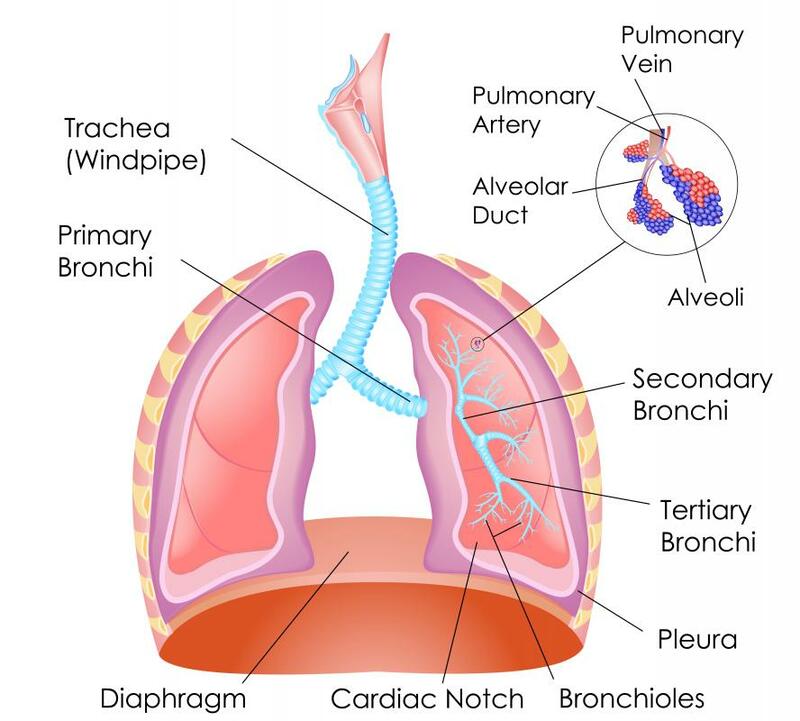 The human respiratory system, with the diaphragm below the lungs. The top of the diaphragm starts on the xiphoid process at the tip of the sternum. The diaphragm, also known as the thoracic diaphragm as a nod to the fact that humans also have another muscle with a similar name, is a layer of muscle positioned within and across the bottom of the rib cage. Shaped similarly to an open parachute, it separates the thoracic cavity of the rib cage, in which the heart and lungs are situated, from the cavity in the abdomen that houses the stomach, liver, and other organs. It also functions to control breathing, as its contraction and relaxation are what allow air to be drawn into the lungs and then expelled, respectively. Convex as the bottom wall of the thoracic cavity and concave as the ceiling of the abdominal cavity, this muscle originates in several locations. The top starts on the xiphoid process at the tip of the sternum, or breastbone. From the lower six ribs arises the middle portion, while the lower portion originates on both the lumbar vertebrae of the spine as well as on the lumbocostal arch, the rim of the opening in the diaphragm, through which the psoas major, a hip flexor muscle, passes. It should be noted that the this muscle has several holes in it at points where vertical structures, including the spine, the psoas major and quadratus lumborum muscles, the esophagus, and several major arteries pass through. This muscle is most significant for its role in helping humans breathe. Whereas the abdominals, particularly the transverse abdominus muscle, assist in exhalation by placing pressure on the thoracic cavity, the diaphragm makes inhalation possible. To do this, it contracts, which reduces pressure on the thoracic cavity and allows the lungs to expand. This produces suction, which further allows air to be drawn in. This relationship between the two muscle groups, with the abdominals opposing the action of the diaphragm, is known in anatomy as antagonistic. Another role of the muscle is related to its function in the abdominal cavity. As intra-thoracic pressure is reduced during diaphragmatic contraction, pressure in the abdominal cavity is subsequently increased. Therefore, this muscle contracts to increase this intra-abdominal pressure during activities like vomiting, urination, and defecation. Similarly, it places pressure on the esophagus during contraction, which helps to prevent stomach acid from traveling back upward into the thoracic region of the esophagus, a condition known as acid reflux. It is also responsible for hiccups, which are caused by spasms in the muscle, often the result of eating too quickly. What Is Arcuate Ligament Syndrome? What Is the Aortic Hiatus? 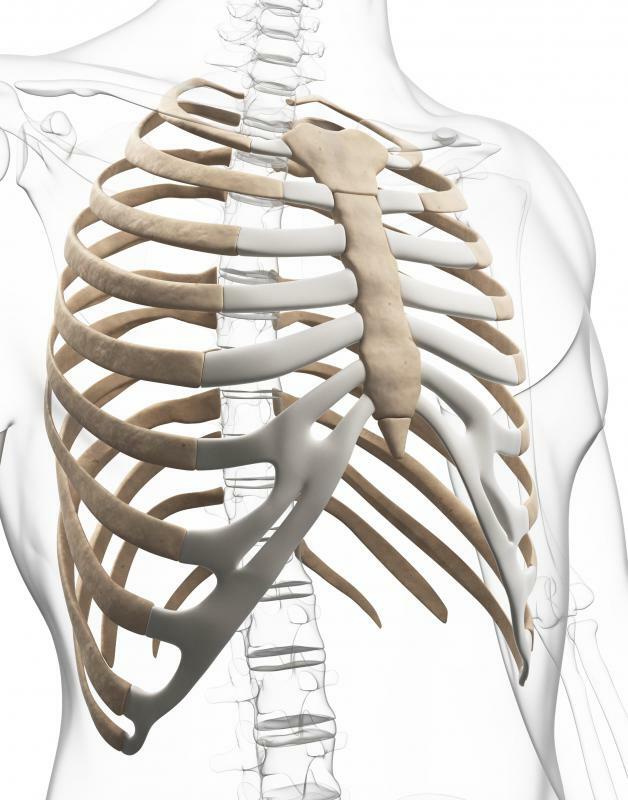 What Is the Thoracic Diaphragm? What Is the Linea Semilunaris? What Is the Meaning of Intra-Articular? What is the Rib Cage? This is very true! Singing is a great example of how the diaphragm and abdominals work against one another during breathing, with the diaphragm contracting to breathw in deeply and the abs contracting to forcibly push air out, as in holding a long note. And yes, breathing properly from the diaphragm helps to both get more oxygen into the body's tissues (thereby improving energy) and strengthen the abs. Thanks for your comment! 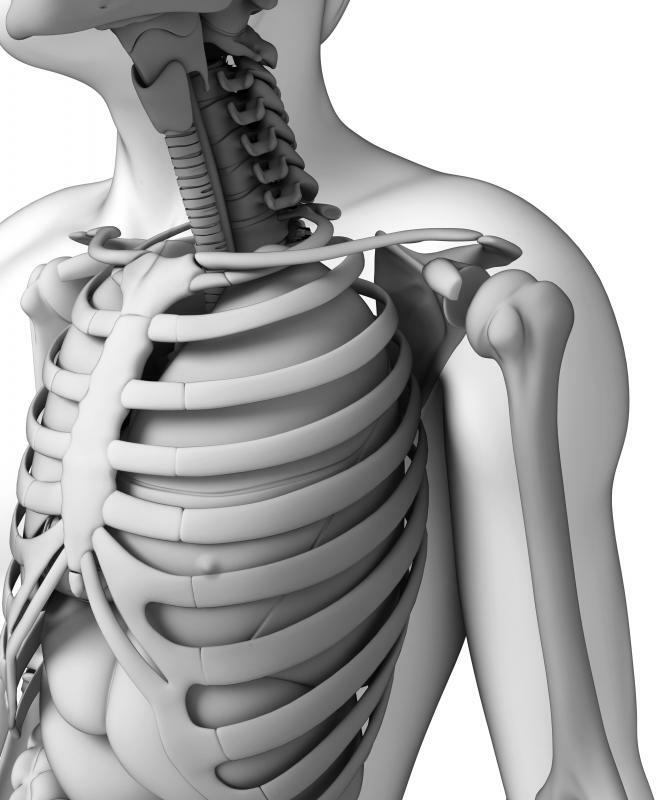 Good article on the diaphragm. When I was in choir in high school, our teacher always talked about diaphragm breathing. I never understood what he meant until he had us put our hands on our stomach while breathing deep and singing at the same time. It really works, I never got out of breath while breathing from the diaphragm and singing. Another benefit I noticed was that if I consistently breath from my diaphragm, I have more energy and my stomach muscles tightened up!